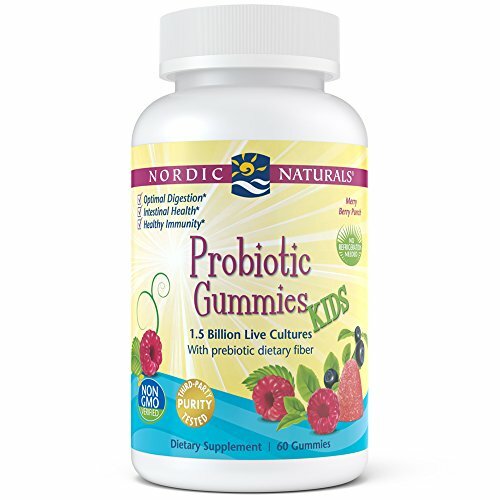 Good health starts in the gut, and Nordic Naturals Probiotic Gummies Kids provide a synergistic blend of probiotics and prebiotic fiber to help establish and maintain healthy digestive balance. When a child's digestive tract is properly functioning, it can better absorb and utilize the nutrients needed for growth, development, and strong immune function. * Our unique probiotic formula allows good bacteria to flourish. They are a great-tasting gummy your kids will love! They have no artificial flavors or preservatives and are gelatin, gluten and diary free. PROBIOTICS FOR GOOD GUT HEALTH - Intestinal health is important for overall health, especially in children. Our Nordic Probiotic Gummies are made from a synergistic formula that combines Bacillus Coagulans, a potent probiotic, with prebiotic fiber. This combination helps rebalance intestinal flora and balance digestive health. * Each serving has 1.5 billion live cultures, or good bacteria, that help destroy harmful bacteria. NO ARTIFICIAL INGREDIENTS OR PRESERVATIVES - Nordic Naturals places good health first. As a result, Nordic Probiotic Gummies Kids have no artificial coloring, flavoring or sweetener. They are non-GMO verified and gelatin, gluten and dairy free. To achieve this, our chewy gummies are pectin-based, and use only sustainably sourced, natural ingredients to create a kids' probiotic without any fillers. No refrigeration required. TASTE YOUR KIDS WILL LOVE - Just two gummies a day facilitates intestinal balance while tasting great, too. Your kids will love the berry punch flavor that they'll look forward to their vitamins everyday. It's a great way to start your kids on a probiotic and a good addition to any dietary supplement routine. You will love the nutrition they provide, and your kids will love the taste. #1 CHILDREN'S VITAMIN IN THE US - Nordic Naturals is known creating quality supplements kids love to take. Our probiotic gummies promote good intestinal health that keeps the belly aches away and facilitates nutrient absorption, important for growth and development. Kids love our easy to chew, tasty, probiotic gummies and you can feel confident in providing your child with a high quality product.